Note from Cory: At the end of my Larry Sanders Show chats with Les, I was looking for something new to watch and discuss. My good friend Myc Wiatrowski pitched me on The A-Team, and the original plan was to watch the whole first season of the 1980s actioneer. However, as you’ll see by the tone and content of our initial discussion of the two-part pilot, neither Myc or I could ultimately stomach watching a full season of The A-Team. As a result, we’ve now decided to turn this into a nine week exploration of various 1980s series about masculine men being masculine men. 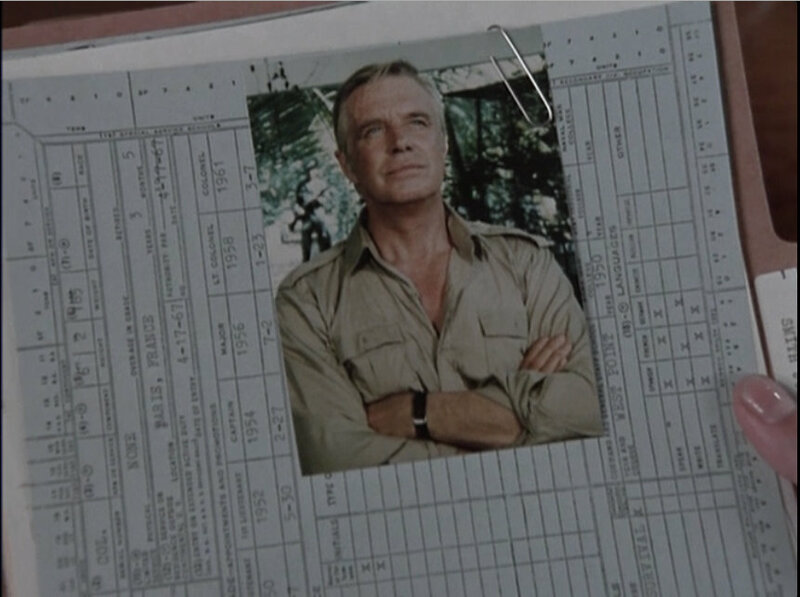 The schedule is at the end of this post, but we’ll be dropping in on Magnum P.I., Simon and Simon, Airwolf, Hunter, and MacGyver over this period. All episodes are available on Hulu. Without further ado, here is our chat about the first two hours of The A-Team. Cory: So Myc, you came to me with this idea. What is about The A-Team that you think is worth discussing? You’re a bit older than me (zing! ), so is it a personal connection that made you want to sign up for a few weeks of Mr. T and plans coming together? Myc: Well, I am definitely a little older than you and I remember watching The A-Team with my father when I was young (probably in syndication since it launched just after I was born and I was not yet five years old when the final episode aired), so there is a personal connection there. And I do love it when a plan comes together. Beyond that though, I feel like The A-Team was an influential show. It dealt directly with the Vietnam War and its fallout, particularly the outcast nature of the program’s heroes which perhaps spoke to a cultural anxiety over the treatment of soldiers who had returned from Southeast Asia in the post-war years. It also was arguably a huge influence on other shows of the time: Airwolf, Knight Rider, MacGyver, parts of the latter Rambo films, and Commando, just to name a few, probably all owe something to the success and style of The A-Team. Additionally, the show has sort of become synonymous with over-the-top cartoon violence and a specific brand of rugged machismo (and sexism) that was present in television and film during the ’80s. Also: Mr. T. How can we not just do this on the basis of Mr. T alone? Without The A-Team, we might not have had an extended post-Clubber Lang Mr. T career to speak of, which would be a travesty considering how he became a sensation in the popular culture of the 1980s. He even had his own cartoon! The show is iconic in some respects: B.A. Baracus (Mr. T) with his mohawk and gold chains; the black and red GMC van; Hannibal Smith (George Peppard) and his cigar chompin’, wise-crackin’ brand of leadership; all of these things can be seen as semiotic staples of popular culture to one extent or another since the show premiered. It has been parodied by Family Guy (“Brian Goes Back to College,” 2005) and Robot Chicken (“Tell My Mom,” 2009), and had a major motion picture adaptation in 2010. For a show that produced less than 100 episodes, The A-Team left a fairly substantial stamp on the pop cultural landscape. The personal connection and what I feel is a pretty significant impact are more or less the reasons why I want to take a deeper look at the show. Cory: I’ve watched the first half of the show’s pilot episode, “Mexican Slayride” (oh my God 1980s episode titles are my favorite thing) and I’m asking myself that same question. At the moment, it’s a little unclear why I chose to do this with you. Still though, I think you make some really fascinating points about the show’s influence on both popular culture and television as a whole. In my experience, so many of these 1980s lightweight procedurals feel the same, so I’m really psyched to get into this one and see if my barely-baked theory holds or if you’re actually correct and this show is more than mohawks, tepid jokes and muscles. And I greatly anticipate hearing your personal experiences with the show, so don’t hold back on that front. Let’s turn to “Mexican Slayride.” Mexican Slayride! What’d do you think of the first part? Did you find that the first 45-plus minutes played like a barely-connected mish-mash of introductions, fist-fights and allusions to both Vietnam and Hollywood, or was there something more here? Myc: I have to be completely, brutally honest. I remember The A-Team being smart; and maybe to a 7-year old, this was the most brilliant damn show in existence. I couldn’t possibly tell you if I’ve seen the epically named “Mexican Slayride” before since the series is largely a blur of explosions, witticisms, and plans coming together, but I can tell you one thing that this episode is not: smart. At least we could always argue that our review of this pilot is a 30th anniversary celebration if we wanted to. The first 45 minutes are incoherent. It is incredibly awkward in what we can generously call its “storytelling.” I want to be kind and suggest that this is a product of it being one “feature length” episode that was later split into two and a difference in the time from 1983 to now, but that doesn’t really explain the terrible nature of this pilot. While I find the allusions to the Vietnam War incredibly fascinating, they are not well executed enough here to have any substantive meaning. I remember it being more important narratively, but I could just be adding that on in my Old Man Brain. Vietnam only serves as a convenient backdrop for the producers of the show to tell us as much about the characters as possible without showing anything. Speaking of narrative laziness, I want to talk really quickly about the scene where Amy (Melinda Culea) talks to the Journalist With Big Glasses and is given information about the A-Team (which makes them seem like a not so secret secret?) and we’re treated to four minutes of dialogue where the background of the team, each of the characters, and their personal histories are explained to us in-depth. That scene summed up the first half of this episode for me: kind of lazy, almost laissez-faire television. What’d you think? Cory: Do you think the pilot actually puts that Vietnam backdrop to any good use? It provides some initial context, and you’re right to point out the frustrating amount of exposition that exists to describe who these people are, where they come from, and who is going to keep coming for them. But outside of that, it’s not as if this first episode is interested in examining what it means for these vets to deal with their post-war lives, nor does it care that a bunch of post-war Americans are trespassing around all over international real estate, blowing it all up. That sequence with Amy talking to her co-worker is absolutely my favorite part of both hours. It’s so unaware of its own silliness and just gets into these obvious generic tropes and rolls around in them. Just the way the files slam against one another as THEIR WHOLE LIVES are described, I had to pull my Netflix cursor back and watch it again. More seriously though: Did this make any sense to you? Despite that heavy amount of exposition in the early part of the first hour, the story itself doesn’t actually hold together. It’s both simple and convoluted at the same time. Am I missing something? Myc: The Vietnam stuff only adds anything to the show in that the audience would have brought an understanding to the program that this episode leaves unspoken. Maybe that’s intentional? It was probably hard to openly discuss the war in pop culture contexts so close to the conclusion of that painful period in American history. Perhaps simply showing them as heroes that have been wronged by the system was enough? It does reflect that after the war they are unable to return to their normal lives, which feels like a significant move. After the war they can’t return to normal and are always soldiers. But you’re also right in pointing out the ability for Americans to move through the world unimpeded. There’s a weird sort of tension between a particular type of hyper-masculine American patriotism and an anti-establishment, stick it to the man type mentality, as seen between Amy and her boss as well as the A-Team and Colonel Lynch. Nevertheless, from start to finish it is a complete mess. It makes almost no sense at all. You asked if you’re missing something, and I think we are: more story (which is weird considering this was two hours long). It’s so disjointed and illogical. The story is simple: girl hires “secret” gang of mercenaries to rescue kidnapped mentor; gang flies to Mexico; gang uses terrible cover story to gain access to materials and create a plan; gang meets with initial success; faces challenges; and ultimately emerges victorious after inspiring the locals to revolt against banana republic dictator. Simple. But everything about this journey is just so… insane? I just have so many questions about the absurdity of everything. What purpose did the armor really plated bus serve? How do the Mexican officials get played by FIVE people who are there to start making a movie? What things really bothered you most about the pilot? Cory: No, I think you’re on-point with the discussion about ‘Nam. There’s something to be said for the fact that they can’t return home, and yet, they’re still sort of completely powerful in these foreign worlds. In that way, the show is both critical of the war but also celebratory of the individuals who were in it, and the kind of national masculinity they represent. That’s not really a surprise. We often see media poke at the system but uphold the individuals. It feels tacked-on 30 years later, and it was probably at least a little tacked-on at the time, but it gives the show a cultural context and maybe makes them more heroic in that context. We’ll see if any of that plays out in the next two episodes we watch. The most frustrating part of this pilot is the indeed the lack of story. It’s not just that it’s incoherent, it’s that so much of it is thinly strung along so that the show can move from set piece to set piece in the easiest possible fashion. In that regard, the second half might actually be worse. I’m being hyperbolic, but it felt like more than half of that second 45 minutes was driven by vehicle-related action sequences set to the show’s already-obnoxious theme song. How long did the pilot spend on that damn little plane? Then the chase at the end involved multiple cars and the plane. It was exhausting. Myc: I’m not really sure you’re being hyperbolic. I am so tired of vehicles. They are EVERYWHERE. This is likely supposed to signify they transient nature of the team, how they’re always or the move with no real home. But I also might be giving the show too much credit. There are vehicles in more than half of the episode. Amy’s car, the team running from Lynch, the plane, endless jeeps, armor plated buses, and so on. I felt like we were watching a recontextualized mash-up of The Dukes of Hazzard and Hogan’s Heroes. Maybe the A-Team was borrowing formula elements from those types of shows. Maybe not. Either way, it was ridiculous. We should also talk about the casual racism. Hannibal’s portrayal of an Asian man in Mr. Lee was everything that’s ever been wrong with American representations of Asian people. Then we have multiple Mexican stereotypes playing out (though truthfully some could just be ascribed to being foreign or non-American stereotypes). For instance: of course the small village is incapable of defending itself because all of the men are cowards. But a few Americans show up, chastise the village, and stand up to the threat and then POW: inspired villagers who now have the capability to defend themselves. And the villains: I can’t even bring myself to call them antagonists because they were so wooden. We somehow get both a completely undeveloped bandito stereotype and a completely undeveloped banana republic dictator stereotype as bad guys in the same episode; it really was absurd. The episode’s primary narrative interest, rescuing Amy’s colleague Al Massey from Mexico, makes some sense, but gets completely lost. The episode spent five minutes setting it up and thirty seconds resolving it. Everything else was extraneous. I understand that often that’s how MacGuffin-like plots work, but it felt especially poorly executed here. Cory: I don’t want to take anything away from the criticisms we’ve leveled at this pilot thus far, because I think they’re mostly warranted. However, we also have the foresight to see that certain things (the cheese and the casual yet unfortunate racism) don’t play at all 30 years later. So I’ve been really trying to put myself in the head-space of someone from 1983, and more specifically a kid from 1983. In that context, this pilot holds up quite a bit better. The guys are tough, American, sarcastic and enjoy vehicle-related mayhem. It’s an 11-year-old boy’s dream. This premiered in January 1983, really right on the cusp of the uber-masculine explosion at the cinema. First Blood came out in 1982, Terminator was a year-and-a-half away. 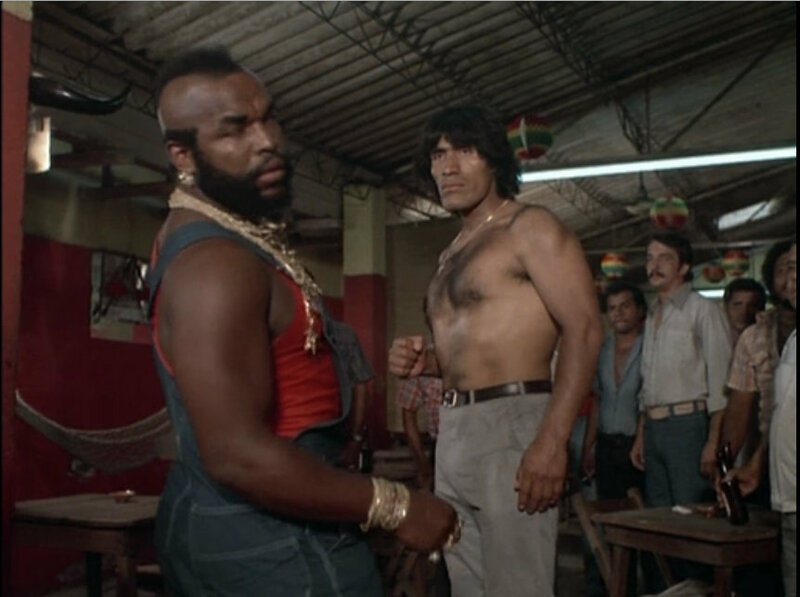 The A-Team isn’t as good as those films (at least in pilot form), but it does belong in a larger conversation about the rise of muscle-bound man bowling through all kinds of situations and continents. And like some of those Stallone and Schwarzenegger films, this show feels a lot like a live-action cartoon. This is sort of the perfect show for early teenage boys to discover. It’s doesn’t care about reality, subtlety, progressive cultural conversation, or story; it’s full-bore action, linked together by catch phrases and scenery-chewing. This is probably why you enjoyed it so many years ago, right? Myc: Most definitely, you are spot on in what brought me to enjoy it as a child. In addition to just spending time with my father watching a “grown-up” show, it was a very easy and clearly-defined show. It was clear who the bad guys were and who the good guys were and while that creates wooden, stereotypical characters, there’s also something to be said for those kinds of appeals. The A-Team was clear in its morals too. We watched two episodes of insanity, and in the last 45 minutes we see guns and explosions and flipping vehicles, yet not a single person dies (or is even seriously injured). Ultimately, the show is very simple. Part of its charm is that it lacks any subtlety or self-awareness. I said earlier that I remember the show being smart, and then lambasted the show for being anything but. However, if I recontextualize it the way you are I think I understand better why I felt that way. The characters have specific identities, simple as they may be, and this always plays into the episodes. They always have a plan, it always utilizes all of their very particular skills, and it always works. It’s the precursor to MacGyver in many ways (which we’ll be discussing in a few weeks). Things may be outlandish, unrealistic, and cartoonish, but they always work, the good guys always win, and order is always restored. And then there’s the explosions. So many explosions and guns and rampant acts of masculinity that was perhaps instrumental in expanding the hyper-masculine explosion of the ’80s. It takes a lot of elements of First Blood and reorganizes them in a safer way for mass consumption. It’s Rambo-light in many ways, and that’s probably why I (and my father, and so many other people) loved it so much. I mean, it was a top ten show in the first three seasons; it appealed to that wide audience. So while maybe it didn’t actively seek to participate in some larger cultural conversations, it still struck a chord with viewers. Maybe the television landscape was just primed for an action-for-action’s-sake living cartoon, and in retrospect that’s probably what drew me to it. Though while this formula wasn’t sustainable, it led to other shows (and films) that built upon the rough, yet entertaining foundation that The A-Team laid.